In May 1967 The Beatles created a ground-breaking album, Sgt. Pepper’s Lonely Hearts Club Band, produced by George Martin and engineered by Geoff Emerick. In his book White Heat, Dominic Sandbrook described it as a ‘continuous stream of sound, its studio banter, steam organs, sitars and even farmyard barking, and its combination of cartoonish psychedelia, circus vaudeville, driving rock music and gentle ballads’ that was immediately hailed as an ‘imperishable popular art of its time’. Fifty-two years later it is difficult to hear its freshness in the context of its first outing, and yet it clearly forms an integral whole — one of the first concept albums — introducing the alter-ego Edwardian brass band with wit, colour and a musical daring saturated in the contemporary zeitgeist. In 2003 the magazine Rolling Stone placed it at the top of its list of the 500 Greatest Albums of All Time. 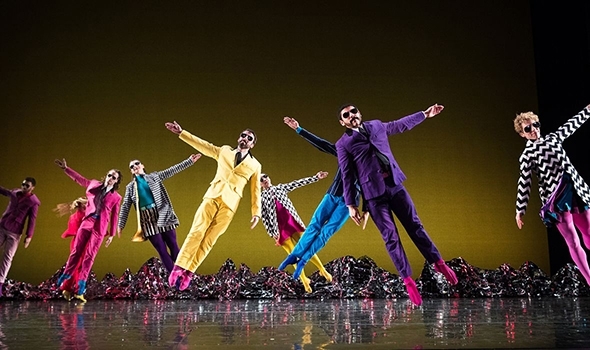 On the occasion of the album’s 50th anniversary, choreographer Mark Morris chose to celebrate it with his production of Pepperland that recently landed on the Sadler’s Wells stage as part of a Dance Consortium tour. Morris may well have felt that his own quintessentially post modern eclectic approach to dance — mixing pop cultural references with highbrow culture and merging genres, styles and dance vocabularies from classical ballet to contemporary dance, folk and music-hall — would prove a suitable match for the album’s own mix of genres; his past works like L’Allegro, il Penseroso ed il Moderato, All Fours and Crosswalk have an exhilarating, colourful dynamic and an intellectual vibrancy that has become his trademark. Pepperland opens on a spare stage marked by an electric blue backdrop that changes to lurid green, orange and pink for subsequent numbers. Designed by Johan Henckens and lit by Nick Kolin, the set also includes a low, static line of crushed silver foil mountains across the back of the stage that flicker in the changing light. The bright colours match and contrast with the stylishly sixties costumes (replete with sunglasses) by Elizabeth Kutzman. The dancers are initially introduced by taped announcement as some of the celebrities and historical figures like Shirley Temple, Albert Einstein, Marilyn Monroe, and Floyd Patterson in Peter Blake’s Sgt. Pepper’s album cover collage. Morris’s approach to gender is fluid and his grasp of mimicry exquisitely camp as the dancers parade in the dazzling light of a Hollywood set before joining hands in a Morris folk circle that coils on itself and then unfurls. It is already clear that the Beatles have taken a back seat to Morris, just as Ethan Iverson’s arrangements of the music for a jazz septet have little in common with the original album apart from the tunes; he includes some but not all the tracks and intersperses them with his own compositions. Morris’s movement and imagery flow effortlessly from 1960s dance floor steps to classical ballet, from Hollywood films to Broadway musicals, but his propensity for quotation has a sense of déjàvu; the references do not come from the diverse canvas of allusions that made the Sgt. Pepper album so conspicuously original but from Morris’s own works. Pepperland barely extends beyond the self-referential — and perhaps even the self-reverential — dulling the pace and invention of the work to a curiously one-dimensional continuum in which the punch and pun, the brashness and edginess of his earlier works are gone. Morris is lauded as a musical choreographer but his translation of the textual imagination of a song like A Day in the Life borders on a game of charades on a summer’s day and renders not only the imagery of Pepperland but its musicality literal to the point of banality. Like the reprisal of the opening theme of Sgt. Pepper at the end, Morris finishes as he begins with a folk circle but unfortunately we haven’t traveled very far in between. Paul McCartney had suggested the idea of an alter-ego band for the new album to allow the Beatles to detach their celebrity from the creative process and reduce the risk of imitation. Morris, it seems, has no such inclination; he invokes his own renown so freely in Pepperland that his creativity becomes a parody of itself.